It was built by Mgr Joseph Debs. 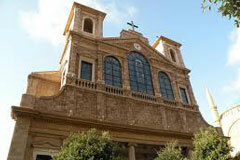 Work began in 1884 and the edifice was finally consecrated on Palm Sunday in 1894. Built on the plan of a basilica with its central nave and two lateral aisles separated by two rows of columns, constructed with a Neoclassical facade inspired by the Basilica di Santa Maria Maggiore in Roma. 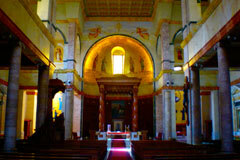 The cathedral was heavily hit during the Lebanese civil war, restored after the end of the hostilities and was re-inaugurated by the Maronite Patriarch Cardinal Nasrallah Boutros Sfeir on 24 April 2000. The roman ruins beside the cathedral or "the Garden of Forgiveness"
The Garden is located directly over the heart of the Roman city of Berytus. The middle intersection of the ancient Roman road: the cardo (running north and south) and the decamanus (running east and west) intersect within the garden. 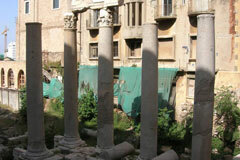 The Roman ruins are a popular Beirut attraction and can be found behind the cathedral.